Collect all of the super-cute Series 3 Shopkins characters and you might be lucky enough to find some rare characters too! 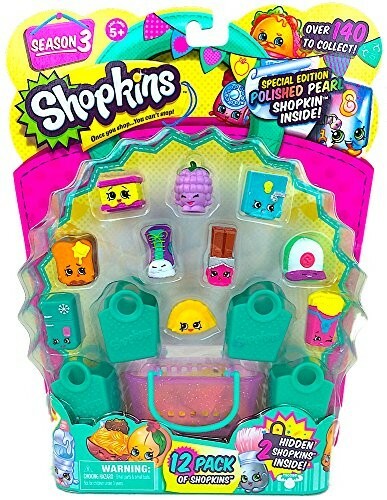 Includes 12 Shopkins, 1 shopping basket, 4 shopping bags and a collector's guide Includes SPECIAL EDITION Secret Sally (3-136), RARE Frost T Fridge (3-105), RARE Sneaky Sally (3-048), and RARE Casper Cap (3-027)! This product is listed on amazon using an ASIN of #B014RWPK4W	. Product prices and availability are accurate as of March 12, 2019 and are subject to change. Any price and availability information displayed on Amazon at the time of purchase will apply to the purchase of this product. Certain content that appears above comes from Amazon Services LLC. This Content is provided 'AS IS' and is subject to change or removal at any time.